Masque, Treatment, and Deep Conditioner. What's the Difference? Do they all mean the same thing? Do certain labels imply its purpose? These three terms imply that an intense interaction is occurring between the chosen product and your hair. Looking closely at each name or label, gives a glimpse of their potential meanings. Treatment - an application of remedies, or an intervention for a matter. Such as treatment for an addiction or other medical treatment. Deep Conditioner - a substance or cosmetic, applied to something to improve its condition. When referencing the hair, you could infer that a hair masque conceals damage, weakness, and other inconsistencies regarding the integrity of the hair. A treatment implies the presence of a problem; the treatment therefore acts as the solution or intermediary. The definition for deep conditioner improves the current condition of the hair. “The difference in these formulas (deep conditioner, treatment, masque) differs from brand to brand. At Mansfield King, we utilize a customized approach for each item we create. For a reparative formula with long lasting effects requires us to come up with unique formula that meets the specified desires of the company owner. Therefore each formula is created intentionally. We have a unique perspective in that we understand that we're not just making products. I can sum it up in this way: It’s not the equivalent of cancer therapy, but it impacts people’s intricate lives, changing people’s perception of beauty and personal experience." So whether or not we understand the true meaning of these words, does not guarantee the product companies agree on the given definitions and the results are virtually up to their discretion. It is however in the companies’ best interest to label or market their product based on what results the product will deliver. High performing companies are well aware of this. With that in mind, here are some examples from each genre. Consider these unique qualities and features when deciding which is for you. Deep Conditioner- Typical formulas are water based and enriched with fatty alcohols, vitamins, and other nourishing elements. The results of a deep conditioner are longer-lasting than a regular conditioner and can typically be used no more than once every 4-7 days. Claim: Hand-mixed with amazing blue green algae, which is rich in vitamin B and helps to improve hair cell regrowth, resulting in thicker, stronger, longer hair. Plus, it will soften and moisturize dry, moisture-craving hair giving it the care and love it needs to have body and shine, naturally. Claim: We love when our curls bounce, shine, and flow freely, but they get a bad reputation when they start misbehaving, naturally becoming dry, hard, and unmanageable. Take control and train them to spiral into perfection, staying soft, manageable, and easy to define. Give them the extra moisture they need with this rejuvenating Hair Mask that's packed with marula—a rich oil harvested for 12,000 years in Madagascar that instantly restores and softens your curls. Finally, you can truly let go and let curls flow. Claim: Effectively penetrates hair to bond with the cuticle, leaving hair revived and restructured for enhanced performance. The must-have product for all hair types! With 21 amino acids, deep treatment is like food for hair—you have to eat to survive and so does your hair. It’s packed with both moisturizing and restructuring proteins that go into the hair shaft and rebuild the internal molecular layer, allowing hair to regain its own internal weight and replenish moisture. Your curls will be softer, healthier, and more manageable. Deep Treatment is also a great color preserver and will help your haircut to last longer. According to Rachel Newman, account executive with Moroccan Oil, creator of the Moroccan Oil masks, says," Depending on the purpose of the deep conditioner, mask or treatment it is possible that they can do the same thing. They all provide nourishment, but it is usually labeled according to the degree of that particular remedy." 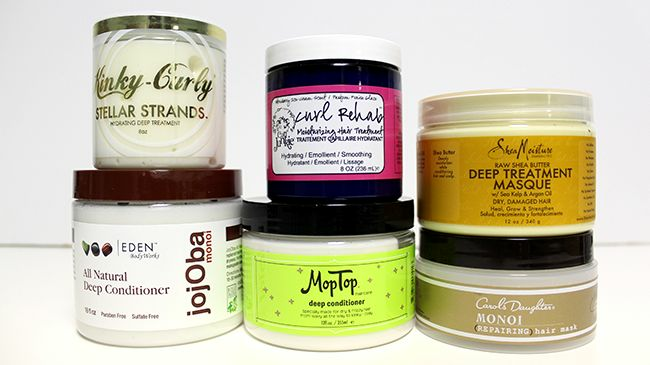 All of these labeled products claim to make your hair better than when you started. However, choose the best one for you to prevent further damage to your current issue. Before making a choice on which is for you, take a look at your current need and match it with the product label details that are speaking the language of your current hair challenge. Do you notice a difference? Which one are you more inclined to purchase?